What is a query tag? What are the benefits of tagging? Tagging your queries is optional, but having a tagging system is useful especially if you have a lot of queries. One benefit of using tags is that they are searchable elements. When you want to locate a query saved in your system, you can use the tag to help you find it quickly. 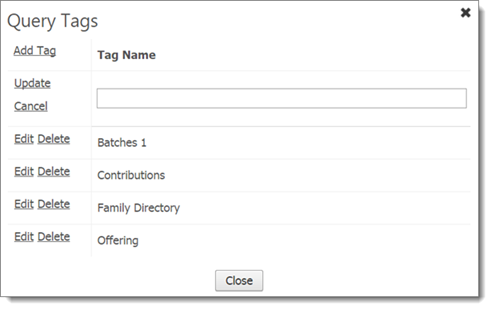 Tags can be used to identify various collections of queries. So, if you devise a tagging scheme that you consistently apply when saving your queries, you can use the tag as a filter to quickly locate all of the queries in your system that share the same tag. The following procedure shows you how to create a tag. After you create the tag, it appears in the Tag dropdown list and is available for selection when you save the query. Follow these steps for each tag you want to create. Click Query Tags to open the Query Tags window. Click Add Tag. Then, in the Tag Name field, type the name of the tag. The list in the Query Tags window is updated with the name of the tag you added. You can now assign the tag to a query and use the tag as a filter to locate queries in the My Queries list..
Next to the tag you want to edit, click Edit. Then, in the Tag Name field, type a new name for the tag. Click Update to apply the new name to the tag. The Query Tags list is updated with the tag's new name. Click Close to exit the Query Tags window. This procedure shows you how to remove an unused tag from your system. Next to the tag you want to delete, click Delete. When prompted to confirm the deletion, click OK. The Query Tags list is displayed. This list shows the names of all of the query tags in your system.